When you purchase a bulk weigh or process hopper scale system from CompuWeigh you can be assured that the system is fully optimized for the most efficient operation possible. CompuWeigh is the only company in the industry that directly designs both scales and bulk weigh control systems. Systems are NTEP and Canadian approved legal-for-trade with accuracy by weight of 0.1% or better. 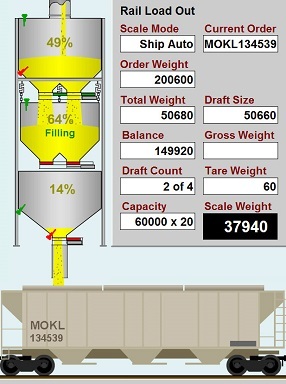 CompuWeigh provides a full range of bulk weigh scales from 3,500 bu./hr (100 TPH) to 120,000 bu./hr (3,000 TPH) systems. We offer complete design services and will provide you a system that meets or exceeds throughput and reliability expectations. CompuWeigh provides a complete line of process hopper scales for legal-for-trade (accurate to 0.1% by weight) weighing of bulk materials. Although these scales can be used for legal-for-trade load-out and receiving applications, they are also utilized for in-process plant production weighing. These scales can handle anywhere from 5 – 260+ tons per hour.